The only way to protect aquifers is “not to drill”. This response came from perhaps unexpected quarters – Councillor Eli Melky (left) – after questioning the Executive Director, Energy, of the Department of Mines and Energy, Victoria Jackson, at last night’s Town Council committees meeting. Four holes in the NT were fracked last year, without a regulatory regime in place, she had said. So far this year no holes have been fracked and there are no applications with the department to do so, but that does not guarantee that there won’t be. That was what was concerning Cr Melky: drilling through the aquifer is the obvious “risk point”. Ms Jackson said the key to managing the risk was “well integrity” and in the NT “world’s best practice” is already followed, based on the standards set by the American Petroleum Institute. Several “redundant layers” seal the drill hole; she thought it was six – three steel, three concrete. Cr Melky preferred not drilling as the surer option. Deputy Mayor Kylie Bonanni (re-elected to that role last night for another 12 months) wanted to know if there had been any fracking proposals that could impact on the town’s water basin. Ms Jackson did not know but said it would be the sort of issue that would come up in community consultation and that there would be provision for exclusion zones. Ms Jackson wasn’t having an easy time of it. Before she had even started Jimmy Cocking, director of the Arid Lands Environment Centre, had questioned her department’s capacity to ensure compliance – he did not say whether it was with existing standards or the yet to be developed regulatory regime – within the Northern Territory. Right: Jimmy Cocking at a protest this morning outside the annual Geoscience Exploration Seminar being held at the Convention Centre. 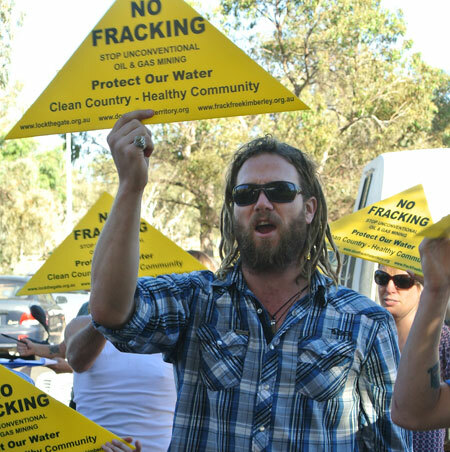 A member of the public, Kim Roberts, wanted to know what plans council had to educate the community about “unconventional hydraulic fracturing for oil and gas” – ie, fracking. These questions were taken on notice. After Ms Jackson’s presentation Cr Jade Kudrenko asked why there was not a moratorium until the regulatory regime was in place. Ms Jackson said such a decision rests with the government but added that the Hawke Report had said there was no justification for a moratorium. Cr Kudrenko still could not understand why activity continues to be allowed. Ms Jackson said there is a “go slow” directive from government but it was correct to say that if there were applications they could get the go ahead. She has applications for 23 holes before her but none thus far for fracking. She was cautious in taking these questions as she is not even part of the Chief Executives’ taskforce which is charged with overseeing the development of the regulatory regime. Cr Kudrenko wanted to know how long that process would take, but Ms Jackson has no control or input into it and couldn’t say. Mayor Damien Ryan’s question was less unsettling. He wanted to know what processes were in place to get oil and gas products to market. The Amadeus Basin is already connected to the north-south gas pipeline, said Ms Jackson, while the other prospective area, the Macarthur Basin, is not far. One of the key weaknesses in the current situation is that standards are set out in a schedule to the Petroleum Act, she explained. These were designed, however, for conventional extraction, not fracking. They also do not have the legal status of regulations, that is, they are “not strictly enforceable at law”. If there were to be a “really big incident” there may be “issues in a courtroom”. Draft environmental regulations, dealing with activity above ground, have been reviewed by an independent expert but still need to be put before the community and industry – how and when remains uncertain. These will be followed by draft resource management regulations for below ground aspects – drilling, fracking, liquids to be used, engineering, well closure. They will be consistent with the Hawke Report and the “onshore oil and gas principles” once these have been finalised after consultation with the industry and community. There will also be an MOU with the Department of Land Resource Management, which manages water until the implementation of the Hawke Report is complete. Ms Jackson sought to reassure her listeners that some sensitive areas will be excluded from oil and gas exploration. She said the NT Government wants to develop the industry for the lasting economic benefits it will deliver “to Territorians” but it will do so “in a way that meets community expectations”. This is Crazy Stuff. I hope the NT government have in place emergency plan to get water into Alice Springs when our water becomes poisonous. And, whoever said fracking can be done safely is not telling the truth and needs to be held responsible in the future, for this reckless decision. Its just for a quick money grab. Long term damage, and poisons pumped into our aquifers. Danger, stupid danger. We live in the desert. Stop the madness. It is not a good idea to drill for gas or franking. The risk is too great. What is going to happen when our water is ruined? This is called greed. How much are we getting out of existing gas? 0. They said the same about mining in the NT. Now most are shut. The average person will get very little out of this. Who thought of this idea has rocks in their heads. This is a bad idea.